I just spent a wonderful day working on copyedits that had me deadline-crunched and stressed (they’re due next Monday). So, for all you writers out there, here is my checklist for a delightful copyediting experience. When you get your copyedits back, DO NOT FREAK OUT that this is the LAST TIME you will ever get to FIX STUFF in your manuscript before readers & reviewers everywhere notice every tiny error and tear your entire book to shreds. Instead, take a full vacation day from work. Get through your copyeditor’s line edits by lunchtime. Take a break at noon and go to your local sushi restaurant. 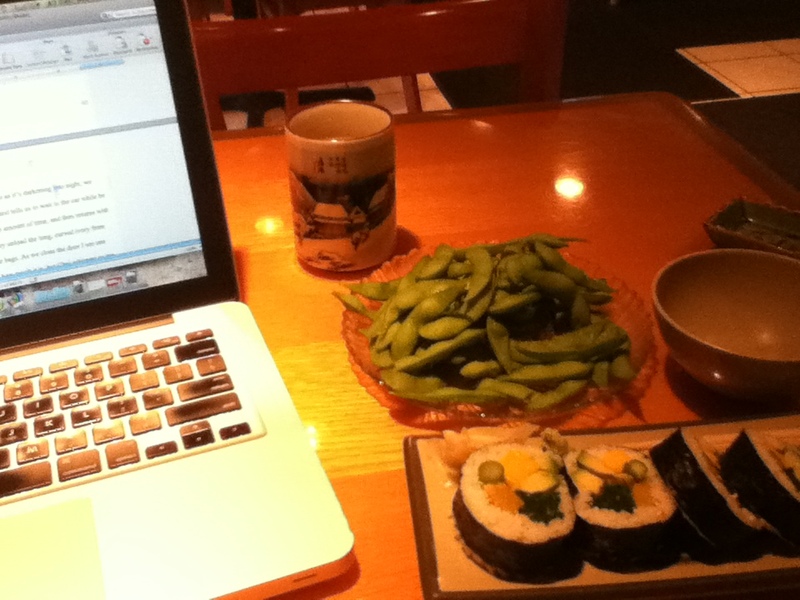 Enjoy hot tea, edamame and (veggie) sushi. Leave a nice tip because you sat there for over an hour. Go back to your local library and finish entering your editor’s comments. Log off and return home triumphant. I get mine next week, Tara. THANKS for the advice. I will follow every step but the contractor and the bathroom. HA!